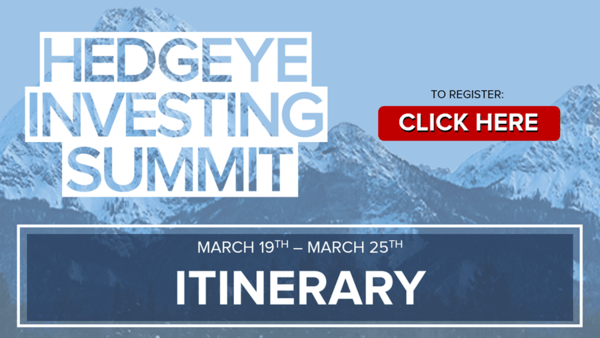 Join Hedgeye CEO Keith McCullough March 19th to 25th for our second online Hedgeye Investing Summit. We've gathered some of the sharpest minds in investing to discuss the most important market trends and explain their investing implications on HedgeyeTV. Click here to register for free access. All interviews with our special guests below will be conducted by Hedgeye CEO Keith McCullough (unless otherwise noted). Video replays will be available shortly after the conclusion of each discussion. "Why Central Banks and Governments May Trigger the Next Crisis"
"Using Macro To Grow Your Assets"
"American Crisis: Deep Demographic Problems Plaguing The U.S. Economy"
"A Hedge Fund Manager Discusses Risk & Opportunity"
"Value Investing In The 21st Century"
"Macro Meets Micro: The Outlook for Retail Stocks"
"Macro Meets Micro: The Outlook for Industrials Stocks"
[11:00 AM ET] -- Michael Holland, Chairman of Holland & Co.
"Big Picture Investing Trends At Home and Abroad"
"This Bear Market Rally Will Not Last"
"Unmistakable Signs Of U.S. Economic Slowdown"
"Prepare Your Portfolio For A Late Cycle U.S. Economy"